My dad had a heart attack yesterday in England. Prayers and good thoughts are welcome! My mom assures me that he is doing well and is recovering from surgery but it bums me out that my mom is there alone in England, an hour away from the hospital where my dad is. She is staying positive and my dad is recovering, but I am wishing England wasn't so far away. 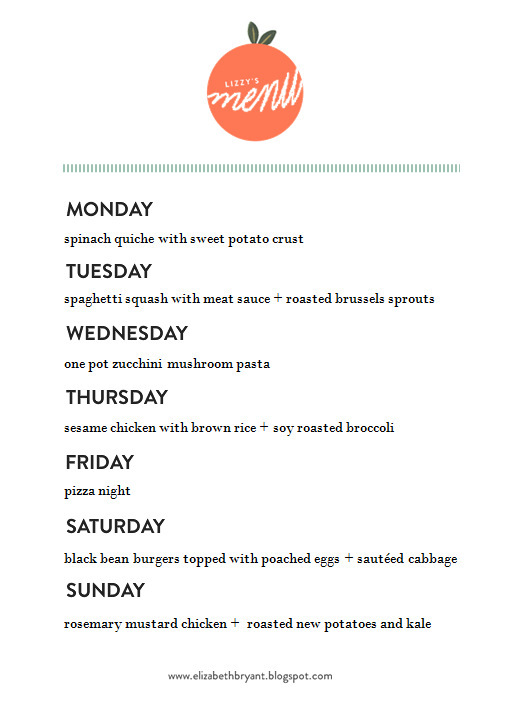 A lot of people expressed interest in my weekly menu post last week so I think I'm going to try to make this a weekly thing. I like to plan out our meals for the week on Mondays so I'll try to post them at the beginning of the week so you can follow along, if you want. If you have some favorites that you make, please share them in the comments. It's like a recipe exchange - minus the annoying chain e-mail! - the meat sauce recipe makes a BIG batch. I like to portion it into about 4 different containers and freeze them for later meals (i.e. lasagna, over pasta, with bread sticks and a salad). - I always like to give myself one extra fast/semi-homemade meal a week for days when something comes up or I'm just too exhausted to make the meal that I planned for that night. This week, I planned to do the MorningStar black bean burgers from Costco (frozen) topped with a poached egg and some pre-shredded cabbage (I buy those bags at Trader Joe's but you can shred it yourself) sauteed in a little coconut oil and garlic. It's delicious. Sorry to hear about your dad. It is so hard when you live a long distance from family. Prayers for your Daddy ~ and Mom. Praying for all your family. God bless. Sending prayers and healing thoughts to your family. I'm so sorry about your dad! Thankfully, there are so many more options nowadays for heart treatments. My dad has had 3 heart attacks, bypass surgery, and he now has a pacemaker. He is in great health, and I am so thankful. I will pray for your mom and dad. On a lighter note, I am so happy you're doing these weekly menu posts! I also plan our meals for the week and buy on Saturday, so I'm thrilled to have more recipes to add in! I always LOVE your recipes! I'm so sorry your dad is sick! I am praying for peace and healing for your dad and strength and peace for your mom. Thank you so much for another menu post! It is incredibly motivating and inspiring to have readily available family friendly healthy menu.